No skin off my bones. I have lived my life to this point very, very opposed to one item that so many people seem to love….. I know what you are thinking. Whhhhhaaaaaaaaaattttttttttttttttttttt? Yes, you heard right. I have been leading the anti chicken wing movement with no solid reason why. Thinking back, I can blame my disgust for chicken wings on my hatred for sauces. I don’t like salad dressings…..not a fan of BBQ Sauce or ketchup, and until recently, I was not a fan of mustard. I understand that to many of you, this is strange. When it comes to the aforementioned condiments/sauces, I have given them all the effort to say with conviction I DO NOT LIKE YOU. Mustard and I got together by happenstance, and we have been doing well ever since. I have tangoed with sriracha….may have a future there….the jury is still out. I am trying new things and attempting to add some sauces to my cooking arsenal. This past weekend Kyle and drove back to my hometown to take my dad out of dinner for Father’s Day. Since it was his celebration, he got to pick where we went, and he chose Quaker Steak and Lube….always a crowd favorite. The Lube is known for their wings, but me….being the wing hater I am, opted for a healthy chicken salad instead of living on the edge. Kyle was the only one of the bunch who got boneless wings. The order was huge, and for some reason he didn’t clean his plate, so we had some to bring back home. Later in the evening during our Mad Men/ OITNB date, Kyle decided he was ready to have the rest of his wings and offered me a bite. I had a little trepidation….I mean, the flavor he chose was called “Boom Boom”, and I am not the biggest spice person either. However, I decided to try the wing bite. Why has no one force fed me a wing before? It was the most delicious thing ever! In fact, I was so obsessed that we ended up ordering a takeout order from Chili’s to share because #cheatmealshappen. My deepest apologies to you, boneless wing. I promise I will spend the rest of my life making it up to you. 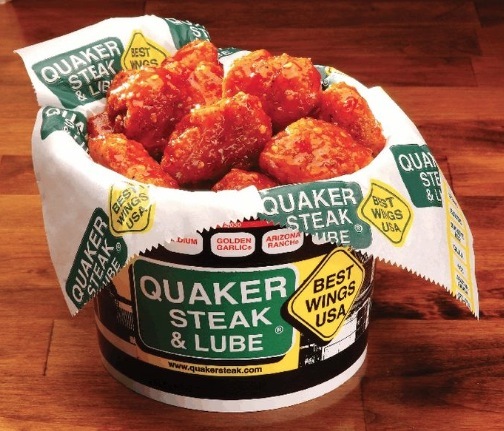 If you haven’t consumed a wing, first of all, congratulations on being part of probably 0 .000001% of the world, but do yourself a favor…..go to Quaker Steak and Lube, get some Boom Booms and rejoice. New favorite cheat meal right here.